If you can make skillet ground meat for tacos at home and know how to roast vegetables, you can make this dish. It is hearty with a healthy portion of vegetables, and sure to delight. There’s also a vegan version for my non-meat lovers posted below. Don’t be intimated if you are unfamiliar with the spices. Most of these are easy to find in your local grocery store or online. The inspiration for this recipe came from a Levantine restaurant in Haifa, Israel named Rola (located at 11 Shderot Moriya Street). 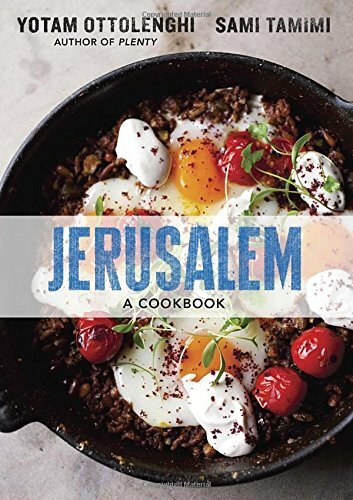 Levantine simply refers to the geographic region that is on the Eastern shore of the Mediterranean, and includes places I recently visited in Israel and Jordan. Most Levantine food is simple and is like building a layer cake, adding texture and spice using common ingredients that are native to the region. Most of the ingredients in this recipe can be found in your local super market. I also included links to products that I use that can be purchased on Amazon for your convenience. The dish is slightly sweetened with date syrup, which in Israel is served with both sweet and savory dishes, and excellent with soft cheese. You may have heard people refer to Israel as the “land of milk and honey.” Locals say that “honey” refers to date syrup from the many date plantations dotting the Israeli countryside. This dish also contains lemony tahini (also check out my recipe for green tahini) and yogurt as condiments—also found in both savory and sweet Levantine dishes. Don't skip the tahini. It ties together the whole meal. There are rumors about eggplant being difficult to work that simply are not true. It has a spongy interior that is highly absorbent, so some cooks prefer to salt eggplant in advance of roasting it for this reason. It helps prevent sticking and the instant soaking up of oil, but it is not required. I’ve tried salting and resting the eggplant, and not pre-salting the eggplant. I found that using parchment works best to prevent the eggplant from sticking to the pan. And, salting helps prevent the eggplant from instantly soaking up the olive oil; however, it cooks fine on parchment paper even if you don’t. Personally, I see salting as an added step. But if you wish to salt your eggplant ahead of cooking it, follow the instructions from the Kitchn. If you are worried about eggplant bitterness, select the smallest blemish-free eggplant you can find, and look for a green top with flesh that is firm to touch. In regard to the spices in this recipe, I generally like to use whole spices and start with lightly toasting them and then grinding them, when I have whole spices on hand. Whole spices and toasting brings out an earthy flavor and aroma. Making this recipe, I used both whole and ground spices because it is what I had in the cupboard. I intend to update this on a later date with options for both. The toasting is optional, but please use whole spices where noted and ground as defined to ensure the balance of flavor. For the pita garnish on top, you can buy pita chips or a package of pita pockets and make them from scratch. I recommend the latter as you may have leftovers and the remaining pita pockets are great for making stuffed “pitawiches” the next day. Preparation for this recipe (and all others) is the key to success. The French term mise en place, which refers to “putting everything in its place” before starting to cook will help you bring this dish together quickly. I recommend pre-measuring your spices, chopping your vegetables and cutting up your ingredients in the right proportions before starting to cook. While your vegetables are roasting, you can prepare the condiments and brown your meat or veggie topping. Other tip: start with a clean sink and dishwasher so you can clean as you go—I’m not always the best at this but it helps! My cooking skills are fairly well-rounded but I'm always learning new things daily with practice and experimentation. Not only do I like to eat but I enjoy trying new foods when I travel, which is where I get my inspiration for new recipes. I’ve also taken several cooking classes throughout the world. These classes include cheese making in Portland, Thai cuisine in Bangkok and Spanish food in Barcelona. I’ve also completed the Stanford Introduction to Food and Health, and have read many recipe books, blogs, articles and academic books about food, including one about the United States food system called Concentration and Power in the Food System. I could argue that this book alone is why I like making home-cooked meals. But my travel, which has allowed me to experience food as a window into other cultures, also tells me that we've got our food priorities all wrong. Our cheapest food is the shelf-stable, highly processed type found in the middle aisles of the grocery store, not the fresh food and vegetables found in abundance in markets and on dining tables in other parts of the world. I believe in using fresh ingredients in my cooking. That is why I’m also an avid gardener and enjoy using homegrown herbs and vegetables to make meals when I can. (This recipe features parsley from my garden.) With summer on the horizon, expect to see more recipes featuring my garden. To say I’m simply interested in food would be an understatement. I love it! Food has always been a big part of my life, from social to celebratory and ceremonial gatherings. My earliest memories of childhood involve food, from making handmade noodles with my grandfather to sugar cookies with my mother—long before I could even reach the kitchen counter. Today, I use cooking as a creative outlet and it is my favorite pastime to share with family and friends. In fact, this recipe was tested by several of them. I hope you enjoy it as much as they did. Time: It takes approximately 45-60 minutes to complete this dish (includes cooking time that occurs in tandem with preparation). Condiments may be made in advanced and refrigerated. Layer or just pile it on and enjoy! Roast vegetables (30-35 minutes): Slice the stem ends off of the eggplant and zucchini. Stripe peel the eggplant and zucchini (see photo) and cut each into 1 ½ inch cubes. Add to a large mixing bowl and coat evenly with 4 tbsp. of olive oil. Space cubes as a single layer using two, parchment-lined baking sheets. Put it in the oven on two racks and roast for 25-30 minutes until golden brown, turning/stirring half way through roasting. Prepare yogurt and tahini condiments (5-7 minutes): Mix 2 tbsp. of plain Greek yogurt with 1 tsp. water (this is to thin it to drizzle on the dish) or use regular plan yogurt. Add to a blender the tahini, lemon juice, kosher salt and water and blend until smooth. Set both aside. Prepare spices (3-5 minutes): Toast coriander seeds, peppercorns and cardamom seeds. Add spices to a grinder or mortar and pestle to grind. Then add ground cinnamon, smoked paprika, cumin, cayenne powder and ¼ tsp of ground turmeric and blend together and set aside (in a ramekin if desired). Chop/cut remaining ingredients (5 minutes): Finely dice one whole shallot. Remove stems from parsley and dice and divide. Cut one pita into half-inch strips, lightly oil and salt and spread out on a sheet pan (if using pita chips, skip this step). Cook protein (7-10 minutes). Heat a large skillet on medium-high. Lightly toast pine nuts for about a minute in the dry skillet. Remove and set aside. Add 1 tablespoon of olive oil to pan. Add shallots to the pan and cook until translucent. Add meat (or chickpeas or other veggie alternative) to skillet and brown it using a wooden spoon or heatproof spatula to break up the meat into small equal pieces as it cooks. Add spices and cook through. If meat/chickpeas or spices begin to stick to your pan, use a couple of tablespoons of water to loosen it and scrap the bottom to mix. Add and stir in pine nuts, half of the parsley, reduce temperature to low heat and cover until ready to plate and serve. Plate the meal (5-8 minutes). Remove the vegetables from oven. Reduce oven temperature to 375 and bake pita slices for 5-8 minutes until crispy. Plate while you wait. Spread (on four plates) a small base of tahini, yogurt and drizzle of date syrup. Reserve some of each condiment for layering between vegetables and meat for about a tsp. of each on each plate. Set the remaining condiments at the table for people to add more if they want it. Add roasted vegetables to the plate. Layer, adding condiments and meat mixture as you plate. Top each plate with the condiment drizzle and toasted pita. Garnish with the remaining parsley. This dish is equally delicious vegan. Here's all that you need to do. Omit yogurt as a condiment. Check commercial package of pita to see if it is vegan. If not, omit it. Use chickpeas (noted above) pulsed in a food processor (shown in my slow motion video below).